Davido- Cheque Flaunting :10M Is this a show off? To who? Davido is really flossing all levels. 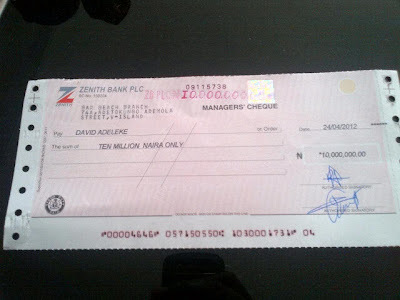 A few minutes ago the pop singer posted the picture of a 10 Million Naira cheque he had just received. "Great meeting, made a lil change" tweeted Davido when he posted the picture of the cheque on the micro-blogging site. Calling 10M lil change. This is too much dont you think? Or this is another way to get the media's attention or what?